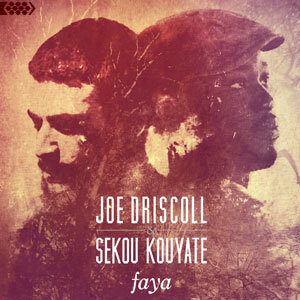 As part of their 2015 North American tour, Joe Driscoll & Sekou Kouyate, backed by bassist John Railton and drummer James Breen, bring their electrifying collaboration to US and Canada. World Music Report: What brought the two of you together? How did you react when you first heard each other’s music? Joe Driscoll: We were brought together by a festival called Nuit Métis, in Miramas, South of France. The organisers had worked with both of us before, and they thought the two of us would complement each other well. As soon as we began jamming, we realised there was some real chemistry there, and that our styles really complemented each other. When I first heard Sekou jamming through those effects, my jaw just hit the floor. I’d never heard anything like it before. 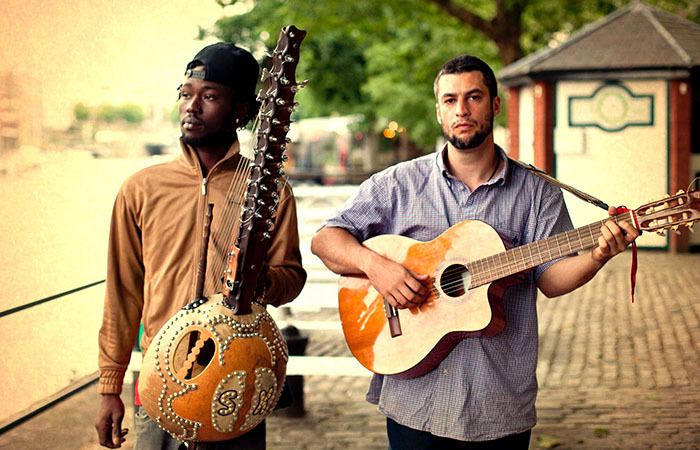 Sekou Kouyate: Yes, we first met in France for a concert we were both playing at. We had no intention of playing together. I am always exploring the universe of music and I love beat boxing and really admired what Joe did when I first heard it. Our cultures are very different but we are from the same generation, and that’s very intriguing. WMR: When did you come up with the idea of working together? JD: It was all a very organic process. Sekou and I were paired up to jam at the festival, and I just left my dicta-phone on the table throughout our jam sessions. In listening back I realised we had some really exciting stuff going on. I realised that through these few weeks of jam sessions, we had enough material to go into the studio and start work on an album. By chance we both had a gap in our schedules, and we did exactly that. The rest followed from the album. SK: We started jamming together in France, and we kept jamming. The vibrations we were making were very positive. It was kind of like “why not?” when we first decided to work together. It felt natural. WMR: How do you think the collaboration turned out? JD: We have both loved the results. 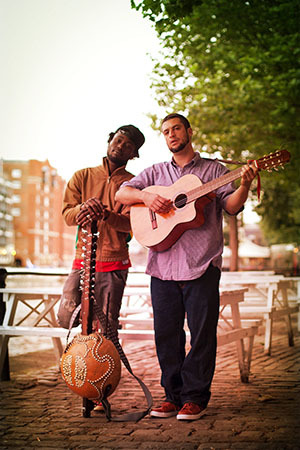 We feel the styles really blended well together on the album (Joe Driscoll & Sekou Kouyate: Faya), and the response to the album has really been amazing. The live show continues to grow in demand for booking; the last two years of touring have been insane. Both in our own satisfaction with the album, and the response from the people- we feel it has turned out very well. SK: I am really happy with the results. I think we took two very different cultures and blended them together in a natural way, which gave a new color to our sounds. I am very happy that we’ve brought our countries together through music. WMR: What do you think should be the take away from this album? Is it just an experiment or something else? JD: I don’t really know if it’s for us to say. Music stirs a different reaction from each listener, and we hope it has engaged people. As far as it being an experiment, I think it has reinforced the old adage that music has the power to unite people from all different cultures and places. I think it can help illustrate East and West can work in harmony, and we all have more in common than we sometimes think. SK: Faya was our first attempt at opening borders and experimenting with our styles. It was a very strong start and I’m looking forward to growing on that. WMR: Western music and African music are very different, melodically and harmonically. Also—and this is so obvious—rhythmically as well… Where do you think that the convergence of the music on this disc occurred and what is unique and different about it? JD: I think really the differences between East and West musically can really create an amazing dynamic when they can play off of each other. Much like cooking, the interesting things come in when you are able to combine contrasting elements- like spicy and sweet. I feel this disc involves Sekou and me each playing our respective styles, but really listening to each other- and just trying to stay play off the other. I think what makes it unique is that neither of us has ever been held to genres, as we both listen to all different styles and genres, and to incorporate that into our compositions. I don’t think the album can really be put into any one genre, so I’d say that makes it fairly unique in even its classification. 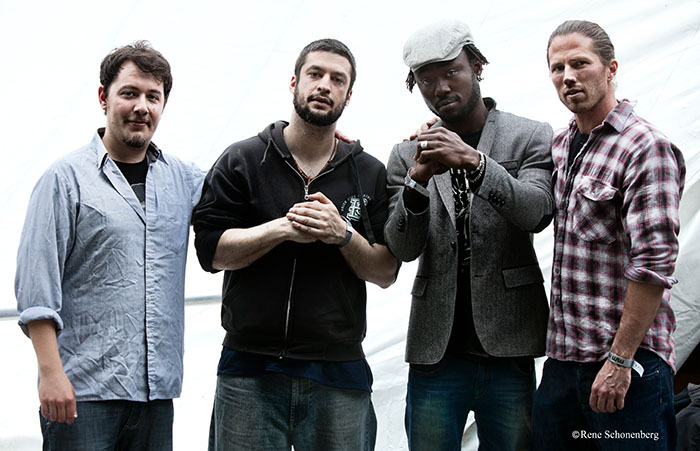 SK: There’s a mix of jazz, blues and reggae in what Joe and I each do separately. I think that’s where we connected. His rap and the riffs of my kora blended together very easily. WMR: Do you see yourselves working together again? Has another project become a germ of an idea already? JD: Yes, we have been writing more songs while on the road together this last year or two, and plan on going back into the studio to begin a new album when this tour is over. As long as the music continues to inspire us, and the audience and booking agents keep showing an interest- we’ll keep following that inspiration. SK: We’ve already started planning our next project and I’m excited to experiment further with new styles and taking this project further. We’ve got lots of surprises planned. I am personally always working on my own music as well and playing the kora for other bands. I love to open my horizons in all directions when it comes to music. WMR: Thank you very much to both of you for taking the time to answer to our questions and connect with our readership.